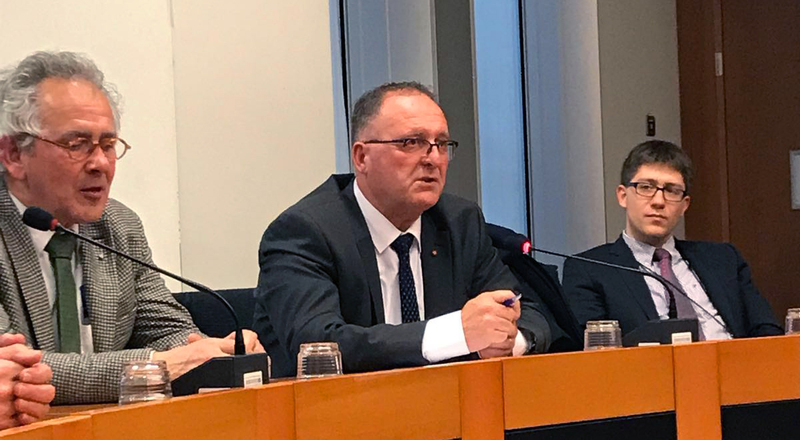 Mario Calleja, mayor of the Douzelage town Marsaskala in Malta, and Sandro Gatt, member of Marsaskala local council, informed the MEP’s Jeroen Lenaers (NL), Roberta Metsola (MT), Ivan Jakovčić (HR), Ashley Fox (UK) and assistant MEP Benjamin Boegel (DE) on the specific dangers for Maltese ships when confronted with human trafficking and the tragic humanitarian consequences for refugees in the Mediterranian Sea when crossing. This topic came up – among many other related topics – in workshops held during the General Meeting of Douzelage in May 2017 in Bad Kötzting (DE). The theme of this meeting was: “Refugees: chances and challenges”. The General Meeting supported the call for support and decided to appeal to European leadership to support the Maltese. They were accompagnied by a delegation of Douzelage Meerssen and Douzelage President, Annigje Kruytbosch. The discussion that followed proved fruitful. Douzelage aims to raise awareness, being a town twinning organisation with first hand information on the subject from our towns. The MEP’s were impressed by the presentation and will keep Douzelage informed. ← Register for the Young Pianist Competition in Sigulda no later than February 12th!